Given how much prices are set to go up on real estate, landlords and renters alike are finding smaller properties to be a better and more affordable fit to their respective goals. However, while a smaller rental property might be more affordable, it comes with a big problem. Prospective tenants might be hard to persuade that they can live comfortably in limited space. This conundrum gets worse the closer you get to centres of commercial activity, but fortunately, solutions are possible. If you own a small rental property and would like to get better responses from the potential tenants you show them to, you need to make the most of every cubic inch present, even if it just means better organisation. You might need to develop a few new skills along the way, as well as be willing to make some smart investments. However, the final product of your labours will prove worth it. If you’re not sure how to get this process started, then you’ve come to the right place, as we have four specific ideas on how to maximise the available space using smart storage possibilities. As you read through this, you might notice a decidedly vertical emphasis for saving space. Cities often use tall buildings to minimise their urban sprawl and these very same concepts can be applied on a smaller scale to the property you’re hoping to rent out. Every single square inch matters in a tiny property, so it might just prove time to start copying the ideas of cultures that know how to save space! Japan is one of those examples, especially in terms of effective architecture that makes the most of what space they have available. Many in the West don’t think swinging doors take much room since they are flat and tall, and yet how much floor space is lost to leave room for the range of motion? You can’t likely replace every door with a sliding one, but how many could you? Don’t forget swinging closet doors! Swinging doors can obstruct freedom of movement, scratch or hit people or things, and sometimes not open all the way, limiting a tenant’s choice of furniture for the room. Any chance to swap out a swinging door for a sliding one will add usable space to a room without having to change the existing layout. Of all the rooms of a home, the garage is likely the one that needs the most attention towards mindful space management. This room is often the final landing place of anything not being currently used, which means it turns into an easy and disorganised dumping ground. As possessions back up, the whole home can suffer. Gladiator Garageworks is a great company to check out for the best storage solutions for this room. It’s worth your time to look over their considerable array of innovative storage options that are dedicated specifically to make your garage a more organised space that can hold more than you ever thought it could. Reinforced cabinets and racks can let you store things on the walls instead of the floor, even if you just use a storage cabinet for a large tool collection. Get even more space by using ceiling space to hang a rack for bikes or kayaks. Your home needs to have space for everything that a tenant might be bringing with them, and you need to show them your property has that space. When floor space is at a premium, you might want to join the urban trend of going long and tall to keep things off the floor. Take a skyscraper approach to everything from closets and bookshelves to media storage and kitchen cabinets. Everything should reach all the way to the ceiling so that no vertical inches are left unused; since every shelf frees up just as much floor space down below. 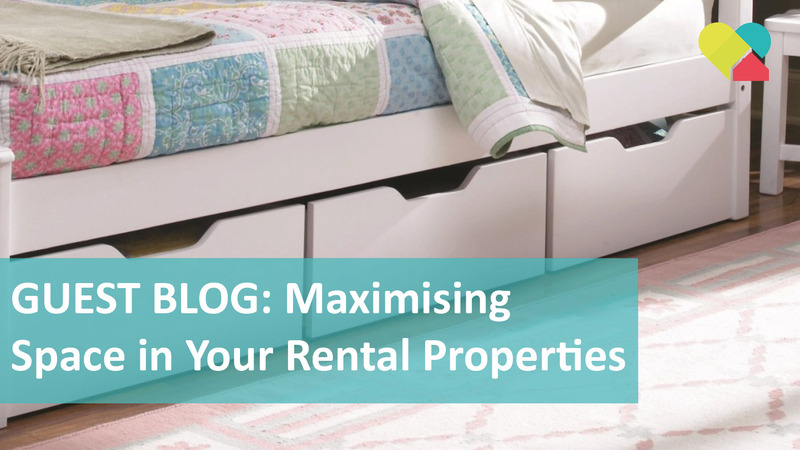 Are you considering furnishing the property you are renting out? A double bed might eat up 40 square feet of space, but with a few minor tweaks, it can add quite a bit of storage space. Fold-away beds are ingenious solutions, but only in situations where they can work. In many other circumstances, it’s better just to raise the bed and then incorporate storage solutions underneath. Some bed frames have storage drawers built-in underneath the mattress and a select few even have bookshelves built into the headboard and footboard. Look for any matching bedroom furnishings that feature big drawers, trundles, and sliding doors. Ready to find a tenant? Contact We Love Rentals for property management in Perth with your first 2 months management fees free! This article was proudly contributed by Gladiator GarageWorks. If you have tiny spaces that need big love, learn more about how smart storage possibilities could help you by visiting out website. Our office will be closed on Friday the 19th of April and reopening on Tuesday the 23rd of April. Finding the right property manager can be a tricky process, especially if you're a first time landlord. How are you supposed to judge the good from the bad, from just a few short conversations? What service should you expect? And what systems should be in place to give you, and your property the BEST care? Perth Landlords - have you lodged your tenant bond? If you haven't, you could face a $5,000 fine plus extra costs. Perth landlord, Mark Alasdair Adam learned the hard way in March when he was fined $10,000 plus $3,775.10 in costs. He failed to lodge the bonds of two separate tenants in 2016, breaching the Residential Tenancies Act. Landlords and Property Managers are legally obliged to lodge bond monies with the Bond Administrator within 14 days of receiving the funds. You can read the full article at RPM below. Is it time to break up with your property manager? How do you know if you have a perfect match or a heart breaker? Is it time to break up with your Property Manager? Here are five tell tale signs that you're not feeling the love and how you can start the process, asap! It's less than you think! In fact, most investors only need to own $2 million worth of property today (say five affordable $400,000 homes) to retire early or achieve financial freedom over a period of 15 years. The goal after 15 years is to achieve an annual income of $100,000 from a portfolio that is conservatively growing in value by six per cent per annum. So, in 15 years’ time the portfolio would be worth $4.793 million, which means a net worth of $2.793 million that is providing four per cent cash flow of about $9,300 per month. There are variable factors that can increase or lower the income and worth of a property portfolio, but this is just one example of a conservative and achievable strategy.